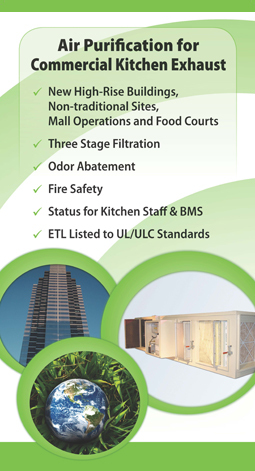 High efficiency filtration of commercial kitchen exhaust is dominated by two technologies: dry media filtration and electrostatic precipitation. The Quiet-Aire Ecology Unit uses simple 3 stage filtration to provide consistent exhaust cleaning down to 0.3 micron with 95% efficiency. It really is as simple as that. Electrostatic precipitation applies some clever science and 10,000V to coax grease particles to deposit themselves onto metal plates. Sounds good, but let's dig a little deeper. Lots. Energy consumption is a major operational cost. Grease is released into the ducts and environment. A. Yes. The degreaser used is expensive. Hot water and waste disposal are required. Daily cleaning is a major operational cost. Q. Are there additional costs during installation? A. Heated water supply, grease traps and drainage all add to the total cost. 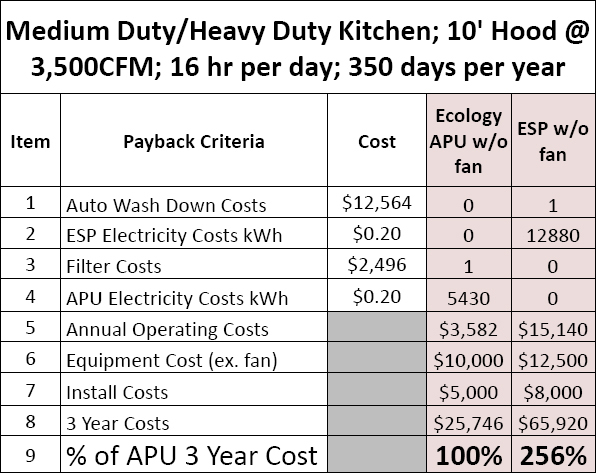 The chart provided shows the 3 year operational costs of both systems. Clearly, the Quiet-Aire air purification system is the most economic system to install and operate. Make it your choice!